The premier and largest BJJ event in the South East Asian region, recognized as the regions premier event will be held over three days . The event will feature both Gi and No gi competitions along with Children divisions and 3 Masters divisions including Masters Absolute and a Women’s Masters White and Blue belt division combined see details below. If you are in the Masters divisions you can also enter the Adults in Gi and or No gi. All Competitors can enter both the Gi and or No Gi competition. Children’s divisions are mixed male and female all belts. All BJJ Teams and players are welcome. To ensure the highest standard of competition, several of the regions most experienced Black Belt referees have been invited to officiate. Six mats will be allocated for the 2016 Pan Asians. Orchid Garden Hotel , booking reference / account code is BJJFP. Breakfast is provided. Special discounted rates have been negotiated for this event. We expect to complete the children’s divisions including the awarding by 1pm. – No alterations will be made to the brackets after the deadline for Corrections on Monday May 15 at 2pm . Please ensure you include your team name when you register. The Discount for two events ( Gi and No Gi only ) is automatic when you register. If you wish to register for two divisions on the same day, you must register and pay twice. BRACKETS – CORRECTIONS – You can make any changes required to your registration on or before Monday May 15 , 1pm. We will be releasing a competitors list here below as the registrations are processed. Subject ” CORRECTION ” anytime on or before Monday May 11 , 1pm. Prior to the Bracket release your entry wil be posted here after you register , any changes can be made immediately. Brackets are printed on Tuesday no changes can be made once the brackets are printed. Brackets posted late Sunday May 14. Check that your DIVISION, BELT, WEIGHT and TEAM NAME are correct. If you do not make weight on the day you will be disqualified. Once the draws are printed after 1pm Monday no Corrections can be made. Once the brackets are completed a Match schedule will be posted below showing your match time and mat number. The match schedules are an indication only of the match time , please be at the venue one and a half hour prior to your scheduled match time. Match’s may start earlier than the prescribed time. Absolute registration will be made on the day for division medalists only, Black belts all competitors can register for Absolute. Please look for the Absolute registration table and immediately register once your division has been completed. The flow of match’s will start with the White belts and Blue belts , and then onto Purple Brown and Black. Kids will be 1st on Sunday and should be competed by 1pm including the awarding. With 6 mats running we endeavor to make the match’s move according to the match schedule and on time. 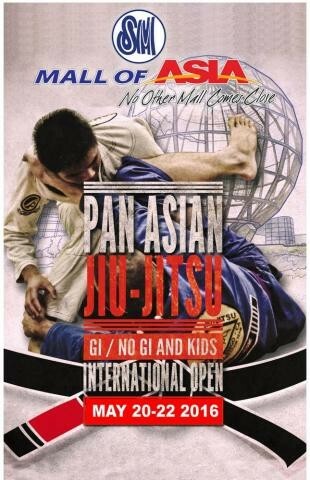 All Masters / Junior Divisions Gi and No Gi – Start time will be at 10.00 am. Juniors white belts: Born 1999 and after. We anticipate all Children’s divisions to end by 1pm including the awarding. 1. Straight foot locks are not allowed in the white belt division. wins there is no further match to decide the winner. The winner of the 1st match is the champion. If the other player wins he will fight the winner of the 1st match to decide the champion. All Black, White, Blue or Pink for Ladies see Gi specifications for patches and length of Gi’s in the rules section. As required by IBJJF. All competitors must wear a rash guard, which reflects their belt. Examples; white sleeves for white belts / blue sleeves for blue belts, or all blue or all white rash guards, short or long sleeve. Minimum of 10% of the belt color should be reflected in the rash Guard. No Gi – Weigh in with rash guard and shorts (no t-shirts, groin cups, body/ hair gel, or knee braces). . Shorts: all Black fight shorts, logos are allowed on both rash guards and shorts, no pockets and zippers allowed. Only athletes with the correct attire can compete, no exceptions. Approved Rash guards will be available at the event. See the link on the front page for No Gi requirements. .
Registrations are processed only after payment has been received. Follow the links after registration. Before his/her first fight, the athlete will check his/her weight wearing the Gi or in No Gi with the correct attire. If the competitor does not make his/her weight, they will be immediately disqualified. Please make sure that you are in the correct weight division. You cannot change divisions after the correction date above. Any false information provided during registration such as Date of Birth and Eligibility qualification but not limited to; Will lead to immediate disqualification; such actions are subject to suspension or even banishment from future BJJFP/ IBJJF events. No spectators or coaches allowed in the competition area except for children’s matches. Children’s matches one coach only is allowed. No Straight foot locks allowed in the white belt division. All competitors to read the Code of Conduct and Competitor Etiquette below. Footwear must be worn around the competition venue at all times; we want our mats clean for the competitor’s welfare and hygiene, walking bare feet is unacceptable in the mall. All competitors must leave the competition area immediately after their match. Competitors climbing over the barricades or walking across the mats to get to another mat will be automatically disqualified. Show respect at all times to fellow competitors, officials and SM staff. All competitors are to wait for the winner to be announced before leaving the mat, in case of victory please stay in the warm up area. All competitors must wear Shoes / Shirts / Pants around the competition venue, change in the changing room provided. Competitors who do not abide by instructions giving by officials can be disqualified and possibly banned from future events. Wear your competition cloths when receiving medals. Use the change room provided. Further obligations; we are guests in the mall, please act accordingly, foul language is unacceptable, children and parents are present..
Do not walk or sit around the mall with out a shirt on, change your shorts or Gi pants in the change area or bathroom, failure to abide by any of these rules will lead to disqualification. With the continued support of SM we are able to stage premier events at SM which are subject to certain conditions. All bags must be in the baggage area, no exceptions. Every person i.e. coach, competitor, spectator at a BJJ event represents the sport, the reputation of the sport is more important than the individual. Individual actions reflect the group, if you are unable to control yourself on or of the mat please do not attend or register for the event. As martial artists we should be an example of what is good about martial arts, respect, honor and good character. Any verbal abuse directed towards the Referee, Officials, SM staff, would be cause for immediate disqualification from the competition and possibly a one-year competition ban, any physical abuse is a lifetime ban without recourse. In certain cases IBJJF will also be notified. If you do not follow instructions given by officials this will be cause for immediate disqualification without warning. .
At any time during a match if a competitor acts in an unsportsmanlike manner i.e. shoves his opponent this is cause for an immediate disqualification from the event, no medal if won will be awarded. Please follow the instructions given by officials or SM Staff, if you are asked to leave the area, please leave. We are all here for the enjoyment of the sport, to see competition at its best and to have fun at these events. The Referees and Officials are there to carry out important functions with out them the events would not exist; they are entitled to everyone’s utmost respect. The Sport cannot accept any disrespect directed towards officials and between individual competitors.